“[A] triumph. Swanson is a name to be considered among the likes of Gillian Flynn, Chris Pavone, and Laura Lippman” (Library Journal, starred review). From the New York Times bestselling author of The Bookseller comes a gripping literary suspense novel set in the 1960s about a deeply troubled family and three women who will reveal its dark truths. Through Silja’s flashbacks, Angie’s discovery of astonishing truths, and Ruby’s strategic dissection of her parents’ state of affairs, a story of love, secrets, and ultimate betrayal is revealed. Cynthia Swanson is the New York Times and USA TODAY bestselling author of The Bookseller. An Indie Next selection and the winner of the 2016 WILLA Award for Historical Fiction, The Bookseller has been translated into a dozen languages. Cynthia has published short fiction in numerous journals and been a Pushcart Prize nominee. She lives with her family in Denver, Colorado. The Glass Forest is her second novel. The mystery in The Glass Forest is a solid whodunnit, but this novel is so much more. It's both an atmospheric suspense and a gripping multi-generational saga, all infused with the bleak desperation of the post-war era. Brazen and courageous heroines show, with unflinching honesty, the ugly sexism that could fester inside a mid-century marriage. A rich and unforgettable read! There is no safe place to turn and no one to trust in Cynthia Swanson’s stirring new thriller, The Glass Forest. Readers will be captivated by this haunting post-war tale of secrets, manipulation, and lost innocence. With a cast of utterly unique and fearless female characters, Swanson turns traditional family relationships upside down to reveal the darkness that lies beneath. 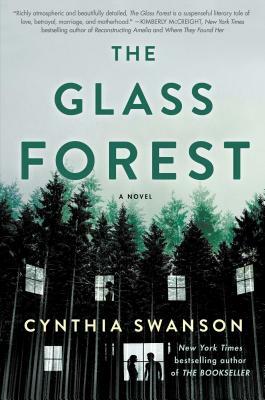 The Glass Forest is the story of three strong women in the 1960s, one of whom has disappeared. Part family saga, part mystery, part coming of age, this richly detailed historical novel is both a fascinating portrait of a woman’s life during this time and a meticulously plotted thriller. I absolutely devoured this gripping and beautifully written novel. Atmospheric and unsettling, The Glass Forest depicts, with razor sharp edges, the walls we don't see until we find ourselves trapped within them—and the chilling, emotional panorama of the view from the inside looking out." [S]tunning… Swanson uses exquisitely rendered characters and an intricately woven plot to explore the cultural and political fallout of WWII, as well as the changing role and limited rights of women in the mid–20th century. This intoxicating slow burn builds to a conclusion rife with shocking reveals. In her follow-up to The Bookseller, Swanson demonstrates her signature trait: a consistent, superbly executed sense of knife-edge disquiet, just bordering on anxiety. She maintains a fast pace without sacrificing literary quality, and multiple characters are developed with unfolding disclosures without losing their individual connections to the reader. VERDICT On the heels of a stunning debut, this outstanding psychological thriller is a triumph. Swanson is a name to be considered among the likes of Gillian Flynn, Chris Pavone, and Laura Lippman. A mesmerizing literary suspense novel set in the 1960s involving three women whose lives intersect over a tragedy. Each woman struggles to find her own identity, define her relationships and find a way to move beyond the limitations of the era and break the glass walls that surround her. A mixture of family saga and mystery, this novel delivers on both fronts.